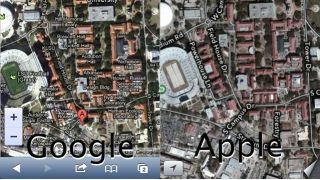 Apple is apparently on the prowl for new recruits who've worked on Google Maps in the past. We have an inkling that this targeted recruitment drive might have a little something to do with the teething problems Apple's been having with its Google Maps replacement in iOS 6. A source "with connections on both teams" told TechCrunch that the fruit-flavoured company is using recruiters to nab lots of ex-Google cartographers. The map-happy techies who leave Google after their contracts end keep turning up at Apple after recruiters get in touch, and for handsome recompense by all accounts. Recent job postings also suggest Apple is currently hunting down more of these experienced mappists, with the source adding that Apple is "going out of its way to lure former and current Google Maps employees" to catch up with Google Maps. The problems with iOS 6 Maps have been myriad since iOS 6 landed last week, the most insulting of which is that every town in Britain has been renamed Dudley (international readers: this is not a flattering reclassification).